Please Note: After you place your order we will follow up with you to confirm the exact sizing of the vest. BlueStone Safety Products Level 3A Full Wrap Bullet Protection vest is proudly made in the USA and provides protection for your entire upper body from handgun rounds. In a world where shootings are on the rise, it is always good to keep protection within reach. 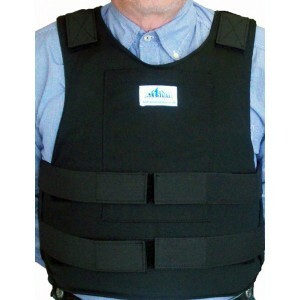 Our vests will stop handgun rounds including 9mm, .357, and up to a .44 magnum at point blank. The vests have a breathable mesh inner lining with durable and washable outer shell carrier. The Full Wrap Bullet Protection vest also comes with an interior soft armor pouch. Available in Medium to 2XL sizes.